‘We stay here and we don’t move.’ This is the refrain in the Choucha refugee camp among those who have been stranded there, in the desert, since 2011. ‘Rejected’ and ‘non-resettled refugees’ are the categories through which these migrant stories have been sorted. They are also the terms that determine the UN Refugee Agency’s (UNHCR) ‘degree of concern’. According to UNHCR’s commissioners, interviewed last year in Zarzis, rejected refugees ‘are not people of our concern any more, so it’s not our problem what they do with their lives. They are not vulnerable or at risk, it is their life, we are not responsible for them and it’s not our fault if they die going to Italy by boat.’  For the same reason, they have also been omitted from the UNHCR’s reports and statistics. Categorized as ‘rejected refugees’ and thus pushed beyond the scope of any humanitarian gaze, the people in Choucha are an invisible presence in Tunisian space. Tunisia has not yet adopted any policy on asylum, despite having signed the Geneva Convention. This means that refugees are not entitled to any rights or benefits. And this is also why asylum claims are processed not by national territorial commissions but by the UNHCR. In similar cases, the UNHCR asks third-party countries with asylum policies to resettle refugees on their territory. The policy of governing migrating populations by moving them towards Western countries was begun in the 1970s; since the beginning of the twenty-first century it has played a pivotal role in the international politics of asylum, in combination with the inverse orientation/direction of the politics of externalization of asylum (that is, the US and EU aim to transfer asylum responsibility to third countries, often countries of transit). The acceptance that Western countries should resettle some refugees goes hand in hand with the demand that the Tunisian government, among others, must set measures for hosting refugees. The UNHCR demand that Tunisia become a host nation for refugees is part of the ‘transition to democracy’ discourse that flourished in revolutionized Tunisia. But in order to understand the irregularization and the rejection of people fleeing Libya we need to go back to the opening of the camp at Choucha and to the UNHCR ‘sorting machine’. 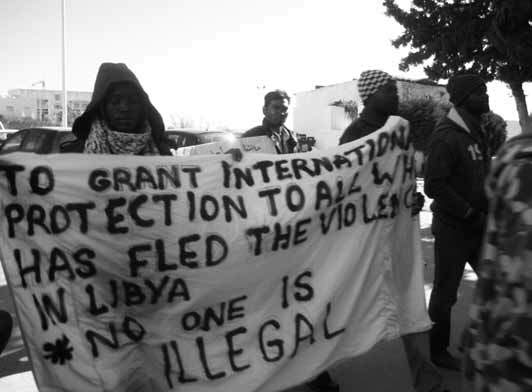 In February 2011, many Libyans and third-country nationals escaping violence in Libya began to cross into Tunisia. With the humanitarian forces of international organizations absent, Tunisian families spontaneously constructed a ‘popular chain’ of hosting in the cities of Ben Guerdane and Tataouine. Some weeks after the arrival of the first people to escape Libya, on 26 February 2011 the Choucha refugee camp was set up by the Tunisian government and then handed over to be managed by the UNHCR. Once the camp was opened, a ‘Babylon’  of 130 nationalities arrived, comprising both Libyans and migrants from around the world who had been working and living in Libya for years. According to the UNHCR’s data, 1 million people entered Tunisian territory, although the majority immediately returned to their countries of origin. If all the non-Libyan escapees were in principle ‘migrants’, those who came from countries to which they could not or did not want to return remained stranded at the Choucha camp and claimed asylum. By July 2012 the results of the asylum claims saw 312 people denied international protection. But this figure does not correspond to the real number of rejected refugees in the camp. Many of them, finding themselves ‘not of concern’ and politically invisible, tried to find informal work and a place to stay in the nearby village of Ben Guerdane, coming to the camp only sporadically and thus being missed in the UNHCR’s headcount. The others – the recognized refugees – entered the ‘lottery’ of resettlement. However, exclusion from concern did not entail exclusion from control. The mobility of the rejected refugees – classed as economic migrants without the legal right to stay – has been constantly monitored by the Tunisian army. When a group of refugees attempted to go to the World Social Forum in Tunis in March 2013 to protest, they were blocked in the city of Ben Guerdane. Following a confrontation with the police, a few succeeded in reaching the Tunisian capital by taxi, sneaking away from the blockade. Later in the year, the delivery of the promised three-month permit for legal residence in Tunisia was dependent on the refugees accepting being fingerprinted so as to be identifiable in Tunisian territory. Activists and researchers involved in the struggles of the rejected refugees were convinced that no institutional solution could be reached within the terms of the international politics of asylum. But the refugees’ persistence has led to an unexpected result: for the first time a national government has accepted on its territory a group of people in the UNHCR category of not eligible for protection. No doubt the Tunisian government decision to grant permits is part of the political game of externalizing democracy through asylum, which is supported by the UNHCR itself. But the people ‘rejected’ and ‘out of any concern’ have gained the right to a space to circulate and stay. The politics of externalization of asylum is sustained and promoted by the broader ‘race to democracy’ that Western analysts associated with the Tunisian revolution. That is, the politics of the externalization of asylum and the politics of refugee re settle ment become combined despite their inverse geographical directions – external ization in countries of origin or of transit, resettlement in ‘safe’ democratic counties – tracing a mobile moral geography of protection. Rather than being mutually exclusive or in conflict, the two mechanisms respond to the ambivalent logic of the ‘protection for democracy’ discourse. On the one hand, the adoption of an asylum policy is seen as the necessary condition for achieving a real democratic transition in countries like Tunisia; on the other hand, democratic countries are figured as the desired goals of refugees, who strive to move north towards Europe or the USA. It is in this context that we can understand the negotiations between the UNHCR and the Tunisian government concerning the refugees and rejected refugees at the Choucha camp, and at the same time the refugees’ refusal of what they call a ‘non-solution’ for them.In the summer of 2012 the ‘allotment’ of hundreds of refugees to third countries started, with the USA, Australia and Canada in pole position (in line with the international statistics on resettlement), Sweden, Germany, Denmark and the UK following at a considerable distance. However, to be a refugee is not a sufficient condition to qualify for resettlement elsewhere. Ethnographic research conducted at the Choucha camp reveals the exclusionary mechanisms of resettlement and the ‘moral economy’ that underpin ‘yearned displacement’ (a phrase used here to indicate that resettlement, as a sort of legalized displacement of migration populations, is presented to refugees as a ‘dream’ to cherish). The first selective filter is applied by the UNHCR, in charge of pre-screening refugees, separating people with acceptable profiles from those who do not match the criteria for a ‘democratic life’ in a Western country. However, the criteria adopted by UNHCR for excluding refugees from the resettlement programme remain secret. Second, those who receive humanitarian approval wait for a country that will accept them. Each state involved in the resettlement programme conducts interviews with refugees, choosing the most desirable subjects on a discretionary basis. The criteria for selection at both stages can only be inferred, by looking at who is excluded. For example, most of those excluded speak neither English nor French. Of course, the refugees at the Choucha camp also try to reconstruct this selective logic, looking at who, among them, remains in the camp and who is sent to one country or another. The refugees have thus understood that Canada accepts only francophone people, while Portugal tends to take those refused by other countries; Denmark takes the vulnerable cases, while Sweden and Norway prefer women. The moral economy of resettlement is easy to discern: ‘After being accepted by the US, I was required to attend a course on US culture and identity in the camp, in which I was explained the moral values of the United States and what is not allowed there; for instance, that polygamy is prohibited.’  And ‘vulnerability’ was certainly not the only sorting criterion – or, at least, the UNHCR definition of who is vulnerable must be flexibly applied. Many women and children remained in the camp in August 2013, after its official closure, forced to approach cars travelling to Libya to beg for water and food, since the UNHCR had ceased to supply any provisions at the end of June 2013. For the humanitarian organizations the Libyan crisis is ‘over’, but in August 2013, according to the refugees themselves, more than 400 people were still in Choucha (a figure that conflicted with UNHCR official statistics, which excluded the rejected refugees and those who live between the camp and Tunisian cities). Today, the UNCHR has stopped counting the people there, and has definitively abandoned the space. But, according to migrants still living in the camp, more than 300 people are currently stranded there, resisting settlement into Tunisian cities. Why are they still there, in the desert? On 17 July 2013, the Tunisian government agreed to the resettlement in Tunisia of all of the refugees from Choucha who were excluded from the UNHCR resettlement programme. Moreover, it signalled its willingness to allow even rejected refugees, now simply classed as economic migrants, to remain. Non-resettled refugees would be granted the right to receive accommodation in the cities of Ben Guerdane and Medenine, 1,500 dinars for accepting the local integration and a three-month renewable residence permit. The immediate reaction in Europe was that an unexpected and positive solution had been found for people who would otherwise become invisible in Tunisia, bereft of any rights. So, did the UNHCR discharge the refugees and Tunisia take them? In fact, the situation is more complex. For, as the refugees are well aware, the partial side stepping of the UNHCR verdict on the part of the Tunisian government – which granted temporary protection to rejected refugees – was actually a solution strongly supported by UNHCR itself. Since some of the asylum-seekers do not meet the criteria for international protection, and since the international politics of asylum cannot by design grant protection to all, Tunisia was de facto asked to resettle, at minimum expense, those people ‘out of any concern’. A similar logic applies to the local integration of the remnants of the resettlement programme, the non-resettled refugees: ‘UNHCR’s strategy aims at promoting autonomy and integration for refugees in Tunisia.’  But in the eyes of the non-resettled refugees the ‘autonomy’ of a life chosen and fixed by governmental and humanitarian actors is not autonomy at all. This helps us achieve a better understanding of what, at first sight, seems to be such a puzzling protest: the resistance of the refugees following the official closure of the camp.‘We stay here and we don’t move.’ But why? Obviously there is nothing pleasant about living in the middle of the Tunisian desert, without food and water. If we look carefully at the reasons for the refugees’ protest and their choice what emerges is their refusal of a political game played out by humanitarian and governmental actors based on a downward logic, which consists in granting the lowest degree of protection possible and inventing new forms of refuge, like the one-year humanitarian solution. A political negotiation in line with the ‘protection for democracy’ discourse, the solution provided by the Tunisian government is actually – as the refugees can clearly see – a non-solution which tries to buy their right to move with a three-month permit to stay in Tunisia and 1,500 dinars – money used by many of them for crossing the Mediterranean by boat to reach the Italian coast. Caught in an existential and juridical conundrum, the people who fled Libya and who have been stranded at Choucha for two and a half years seem not to have any other option than to buy their escape with the ‘humanitarian’ money. The risks of living in Libya, the impossibility for most of them to go back to their countries of origin – despite UNHCR’s list of safe/unsafe countries7 – and the forced relocation to Tunisia, pushed some of them to leave for Europe by boat. After months of protests in front of UNHCR’s headquarters in Tunis and at the Choucha camp,  the decision of the Tunisian government might have seemed like an unexpected victory – but for the remaining refugees it is a political game in which they refuse to take part. If, in the first stage, the resettlement programme was strongly supported by UNHCR as the only chance for refugees to live in a democratic country, by the end the offer of residence in Tunisia was suddenly also presented to the 400 non-resettled refugees as a real democratic solution. In other words, two different orientations of democracy coexist within the ‘protection for democracy’ discourse: one says ‘resettlement in third countries is the only safe and viable solution’; the other contends that ‘countries like Tunisia are now facing the test of democracy’. The struggle of the rejected refugees and of the non-resettled refugees at Choucha has been unceasing, with road blockades, sit-in protests and declarations. All these have had to confront the discourse of humanitarian actors and the ‘solution’ that seems so obvious to anyone who has only seen the images of the camp without following the logic of refugees’ resistance. Since the beginning the UNHCR’s commissioners have pointed out that the camp must be closed; that it is not a viable human habitation. And this is obviously undeniable. But the refugees’ claim, ‘We stay here, we do not move’, is not a defence of the continued existence of the camp; rather, it points at the tactic of discharge played by humanitarian and state actors in closing the camp with no real solution for everybody, thereby rendering their lives invisible in Tunisian space. The exact number of rejected refugees living in the camp is impossible to establish: 312 in December 2012, probably 272 in August 2013 according to UNHCR. In January 2014, after the definitive departure of UNHCR, the only estimate comes from migrants, who count about 200 rejected refugees still in the camp. Many of them, even before the decision of 17 July 2013, moved to Tunis or to Ben Guerdane to find work, since their presence in the camp had effectively been effaced by humanitarian forces anyway. In October 2012, UNHCR, Danish Relief and Croissant Rouge stopped providing food and water to the rejected, as ‘people not of our concern’. Moreover, recognized refugees were very strongly encouraged not to speak with the rejected, who were ushered into a marginal area of the camp. From that point on, the protests at Choucha changed. That episode marked a watershed, highlighting the different futures mapped out by the different migrants’ profiles and categories. Non-resettled refugees and rejected refugees were now divided in their protests, the former addressing UNHCR as the agency in charge of their condition, the latter instead aware that no institution could effectively respond to them given their status of being ‘out of any concern’. In fact, all their claims were systematically rejected as inappropriate because of the non-jurisdiction of institutions over rejected refugees: the very possibility of laying claim relies on the fact of being subject of and subject to a certain governmental agency. By splitting the camp into two areas and marking the distinction between the condition and the rights of the non-resettled refugees and those of the rejected refugees, UNHCR’s categorization in part succeeded in dividing their struggles. However, since the beginning all the people stranded at Choucha camp have based their protests on one shared claim: ‘We all fled from Libya, from a war; and that war was provoked by states that today refuse to host us’, stressing that ‘since all of us come from Libya, the international protection must be given to everybody’. Underlining their common provenance and their shared experience, the claim reveals the inadequacy and the untenability of the country-of-origin logic, upon which Article 51 of the Geneva Convention is predicated. Emphasizing their common provenance from Libya, they opposed the concreteness of the period spent in Libya – years spent as migrants or migrant workers – to the fiction of how their life would have been in their countries of origin. For it is precisely that concrete life – and not the life they lived years ago in their country of origin – that they consider to be displaced and scattered. From this perspective, their demand has breached the logic of asylum, overcoming the national blueprint that underpins the system of asylum, with the pre-eminence of their – always heterogeneous and singular – migrant condition. ‘We stay here and we don’t move’ is the most radical statement for making a space for themselves. Or, to put it differently, they squatted the space of ‘humanitarian sorting’, turning it into a place from which to refuse to accept the ‘democratic game’. The protesting refugees have reshuffled the priorities of democracy, staging it first and foremost as the possibility for moving and settling themselves across space – without being allocated to a state. 1. ^ Interview conducted with a UNHCR commissioner in the UNHCR headquarters of Zarzis (Tunisia), 2 January 2013. 2. ^ This is the title of Ismael Chebbi and Youssef Chebbi’s film about Choucha, documenting the events and the situation at the camp between February and March 2011. 3. ^ As declared by the UNHCR, ‘of the 10.5 mil ion refugees of concern to UNHCR around the world, only about 1 per cent are submitted by the agency for resettlement’ (Resettlement: A New Beginning in a Third Country, UNHCR, www.unhcr.org/pages/4a16b1676.html. [archive]) At the point of the closure of the Choucha camp 3,550 people had been accepted for resettlement; 326 are still in Tunisia, waiting to leave for the USA. 4. ^ G., a Somali refugee, waiting in a hosting centre in the Tunisian city of Medenine to be resettled in the USA. Interview conducted in Medenine in August 2013. 5. ^ According to the UNHCR, around 700 refugees have been resettled in the cities of Medenine, Ben Guerdane and Zarzis. 6. ^ UNHCR Tunisia Bul etin, Le HCR présente sa stratégie dans le cadre de la fermeture du camp de transit de Choucha, March 2013.